Hello friends. Welcome to 123greetingsquotes.com. We are a wonderful team with loving care for you to meet the needs and queries with wonderful different collections of awesome wishes for you and for your friends. Here is a beautiful wishes for the Wedding Anniversary which you can share with your friends or family members who are celebrating their marriage anniversary. These are a great words and I assure your loved ones will definitely like this and will have a special feeling of how much you love and care for them in this world. Wedding is a special occasion of bonding two awesome people to make one wonderful life on this planet. We know how special a marriage is and I think its really glad to remember such beautiful day of our life. When we want to tell someone that they are special in our lives this will be a best time to remember and wish them in a great way especially in our local regional language. Here I have presented this wishes not only with beautiful words but with a mind blowing image of Tamil marriage greetings. Why late , just send these to your brother sister, cousin, mom , day though anSMS, message or email or whatsapp any way you like. 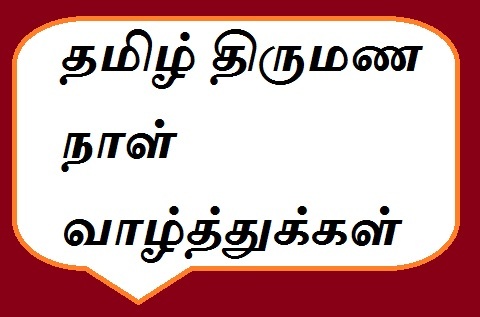 Tamil is a beautiful language and I know it will be something special when we wish someone whether they can be our friends or parents or anyone in our family when we greet them in Tamil font. Marakka mudiyaadha naaLaai.. kondada en vaazhthukaL..
Idhaiyathin yellaivarai magizha.. nal vaazhthukaL..
Tamizhil kooda varthai yillai.. Ungal tyaagangalukku mikka nandri..